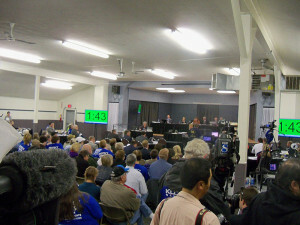 Hundreds of people turned out for the IUB hearing on the Baaken pipeline. Hundreds of people packed a room in at the Boone County Fairgrounds today to speak and listen to comments at a public hearing on a construction permit for the Baaken oil pipeline. The Iowa Utilities Board has more than 200 people signed up to testify. They are alternating between those for the project and those against. Jonas Magram of Fairfield spokes against. “The board must reject the Baaken Pipeline just as the Keystone was rejected last week. The Baaken will contribute very little to Iowa’s economy. It will not reduce Iowa fuel costs and it will not reduce rail shipments of Baaken oil,” Magram says. Magram says the pipeline will bring many problems. “It will create an unprecedented abuse of landowner’s rights, it will present a perpetual threat of catastrophic spills in Iowa, and it will contribute to climate change,” according to Magram. He criticized the Utilities Board for alternating the hearing between those who are for and against the pipeline, saying it gives the idea that the support is equal. 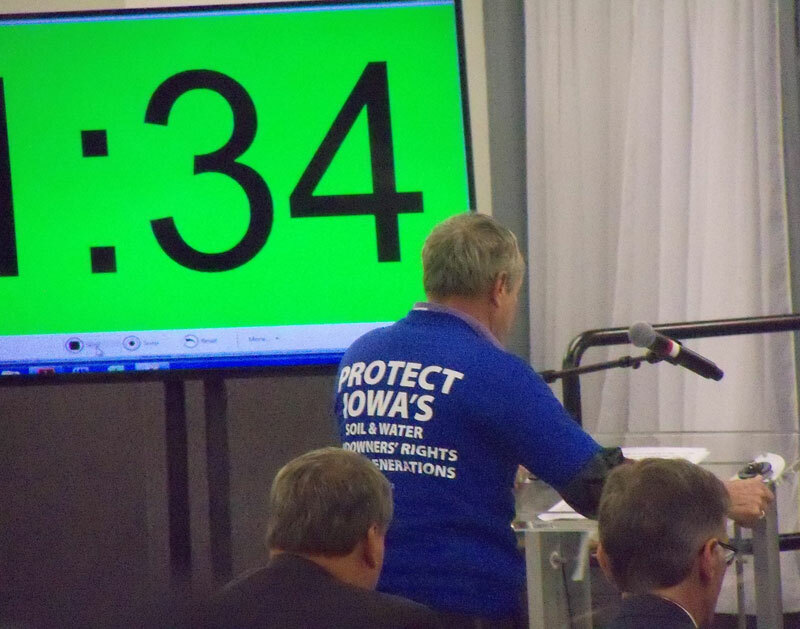 “The board’s own website shows that 60 percent of those scheduled to speak today in favor of the pipeline are not Iowans, whereas 98 percent of those who are scheduled to speak against it are Iowans. The same can be said for the letters that you have received,” Magram says. A large clock counted down the 2 minutes allowed for each speaker. 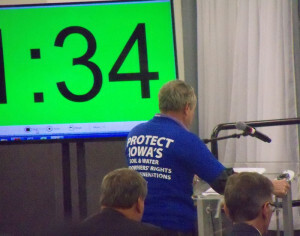 Mike Matejka of Des Moines spoke in favor of the pipeline. “As a laborer, people are going to refer to our jobs as temporary jobs,” Matejka says.”As a laborer, a construction worker, every job is temporary. As a laborer it is a career.” He says the work the project will provide is important. “Allowing this pipeline is not only good for the country and energy independence — it’s decent jobs at a time when decent jobs are very badly needed in this country,” Matejka. William Alexander of Ottumwa says the company that plans to build the pipeline should not be allowed to use eminent domain to get right of way. “Dakota Access isn’t a utility company, others that received eminent domain were utilities. Dakota Access is an intrastate crude oil pipeline, and I believe under Iowa law, they can’t take eminent domain for taking agricultural land,” Alexander says. He had more questions about the company. “Where is the projected profit and loss statement for this project? We only saw their projected expenses. Why? Afraid to show this amount,” Alexander says. “How many oil pipelines has Energy Transfer put in? How did their board of directors allow a project of this magnitude without knowing the projected profit? Maybe we should ask Rick Perry, a board member. When it leaks do we sue the Iowa Utilities Board? Dakota Access has already circumvented the Iowa Code twice. How many more times?,” Alexander asked. He says the pipeline project will benefit him long after it is built. “Rather than tens of thousands of dollars in college debt, I am gaining the skills I can use to build a future for myself and my family right here in Iowa,” Walsh explains. “The training that I will receive — as well as many others — the use of the latest technology and safety standards will ensure the safe installation and operation of the pipeline.” Walsh says the pipeline will benefit everyone. The two minutes of testimony were often followed by cheers and clapping on both sides of the issue. Some of the speakers went silent as the microphone was turned off when they hit the time limit. The IUB is not taking any action at the public hearing, and will consider the comments along with others it has received on the subject to make a decision later this year.